In my last post I made brief mention to one of life's great pastimes, bedroom dancing. However, the truth is I've recently made the leap from thebedroom to living room dancing. One perk of moving back to Auckland is I can have a place of my own, which means I can freely dance around the living room without bumbing in to flatmates or their crap. So what's been my most danced to record of late? Moejadkatebarry! 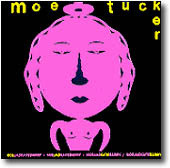 I don't quite get what why this is officially a Moe Tucker record, rather than being Jad Fair, Kaye Messer or Barry Stock, but that's hardly important. The album's an absolute blast; quickly recorded, with all the enthusiasm and joy you would expect from anything to do with Jad Fair. I bought it quite a while ago and it never excited me too much before, but now it just seems perfect. Plus to make things even more exciting I've recently worked out how to covert vinyl to mp3. It's pretty terrible sound quality but who cares, I've always been more interested in song quality. So here's Jad Is A Fink, it's basically just a groove rattled along for a minute and a half - but I damn good one. Moe Tucker fans should also pop over to Fire Escape Talking for an mp3 of Moe and Jonathan Richman playing, 'I'm Sticking With You'. among the aisles is just me writing about pop music and the like. it's mostly done as a way of archiving my own music listening and gig going, but if other people can get some satisfaction out of it that's great. i'm unlikely to be the first to write about any bands, but sometimes pop songs still sound good six months after they're released! i will sometimes post some mp3s, but only for a short while and stuff that isn't commercially available. if anyone has a problem with any of it contact me and i will remove it straight away.